Sophisticated winter blooming tree that we love for its incredibly sweet spicy scented flowers. 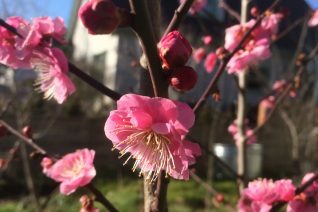 Double pink flowers are conspicuous and perched perfectly on the green twigs of this asian flowering apricot. Flowers appear in December in mild years as late as February in the coldest. Flowers last forever in the cool winter air. Each spicily scented flower has a prominent boss of white stamens. Its the details man. Flowers are hardy to around 20ºF- closed buds are substantially hardier and will unfurl when the weather warms. Moderately fast growing tree to 18′ x12′ in 10 years. Appreciates deep, rich soil and definitely weekly summer water in its first few years. Fall color is pale yellow. Inedible ornamental fruits often follow the blossoms. Japan.